The Chesapeake Condominiums at 200 East Southern Avenue were originally built in 1986. At Chesapeake, there are 192 lots averaging 712 square feet. Within the community there are two swimming pools for resident use. We know that this area has long been liked by owners, renters and investors alike. 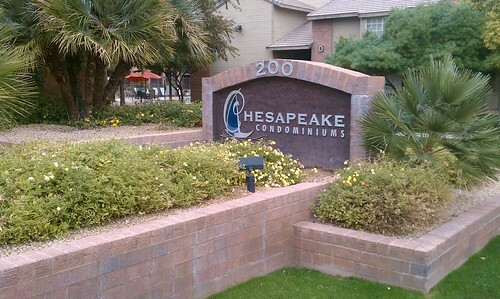 The convenient Tempe location of the Chesapeake Condominiums gives residents easy access to freeways, restaurants, shopping, the Mill Avenue District, the ASU campus, the Orbit transit line and much more. Having the Orbit system stop across the street on College Ave is certainly one of the many benefits to this location. Being able to walk to some of the local restaurants nearby is pretty cool, too. The information below will show you a sample of homes for sale at the Chesapeake Condominium complex. ( Listings will display only if there are any homes currently for sale at Chesapeake ) Please feel free to call Nick Bastian at 602-803-6425 to view any of these homes for sale or lease. My office is just east of these homes and is located at 1400 E Southern Ave. #100 Stop by for a free list of any Tempe real estate information that might be of interest to you.